I was in a mood to make a quick little project yesterday on my only day off work, for a week. 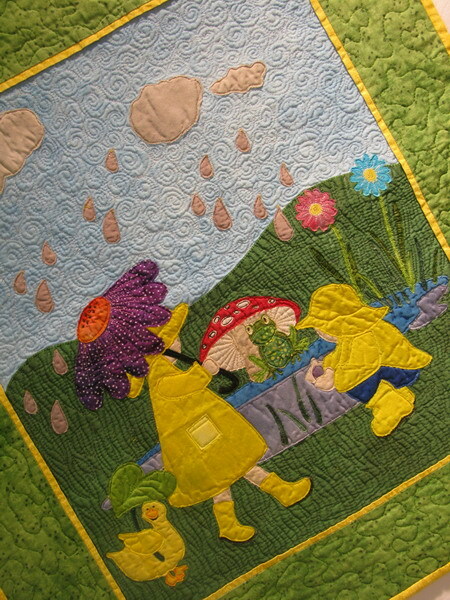 Angie over at Angie's Bits and Pieces had just posted a new little April Showers applique. 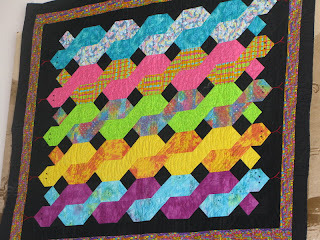 I was having such a good time practicing my free motion quilting. 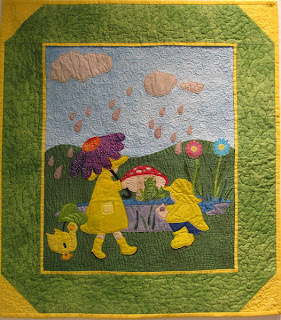 When whoosh, I needed to iron down a piece of the fusible applique that came loose. What happened after that made me want to cry. After all my work at making sure my hand dyes are washed so they don't bleed, what happens, but a big ole green bleed mark not only on the front but the back too. ARRRRRGH! I decided to throw it in the wash right away to hopefully get it to come out. 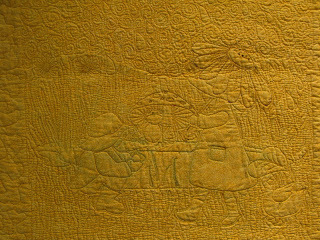 I must say, I do love the looks of the quilting on the back. One of the ah-ha moments was when it came out of the dryer. I don't wash my wall hangings that are fusible. Not sure why, but I never have. But that is all about to change. The dimension and texture I got from the washing and drying is incredible. It makes me happy just looking at it. Yeah the green sure has bled thru, but what the heck, it's the back after all, right? The front is all good and well, and makes up for it all. 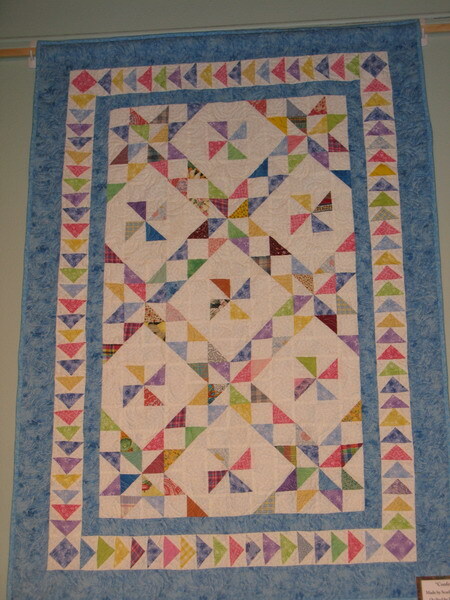 Thanks Angie for yet another great project. I love my wall hanging. I taught a class this past weekend with our "Just Quilting" group. It was sure fun to get back to those Hidden Wells. 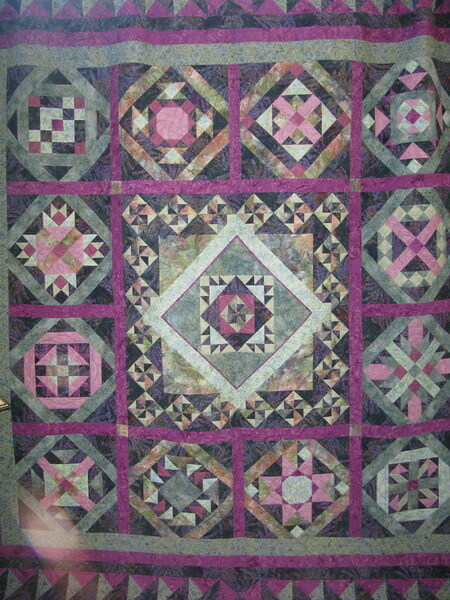 This is my sample quilt. 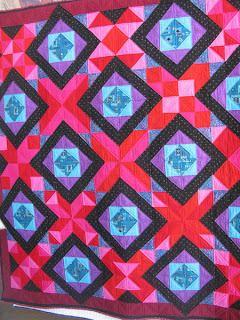 I fell in love with the border fabric, so my quilt ended up being smaller than I had planned so I could have enough for a nice size border. Everyone seemed to have a good time seeing their fabrics come together and to my knowledge no one went home crying! Can life get any better than that? 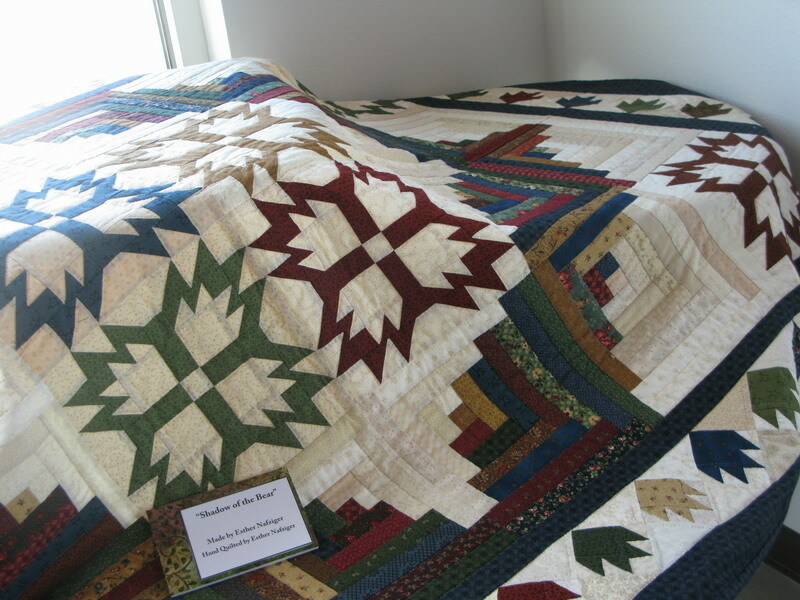 :-) The hardest part of it all, is the fact that I have to wait for another month to see every one's quilts. No, I really am not missing in action. 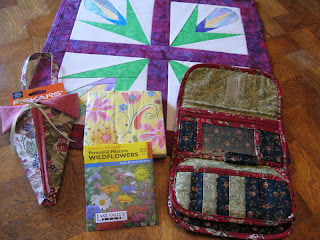 But I have been busy stitching. Sure do wish I could show you, but one, is a project that will be unveiled (ohhhhh, sounds so regal ) at the Bloggers Quilt Festival that Amy over at Amy'sCreativeSide hosts next month. If you haven't done or seen the Bloggers Quilt Festival, it is a must. So go check it out and get your project ready. 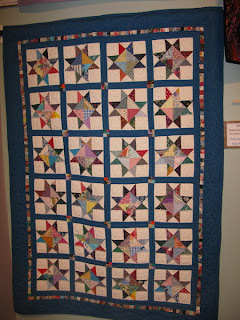 The other is a July 4th project that was actually on my PIGS list and great fully marked as DONE!! Yippee. So you just have to wait to see them, but I have "really" been busy working away. I went on a little quilting retreat a couple of weeks back, with a friend and went to a quilt show in Pueblo Colorado. It is a small show, but a great one. We rented a suite at the Cambria Suites and sewed our little hearts out. For the second year, their guild had a wonderful display along with it. 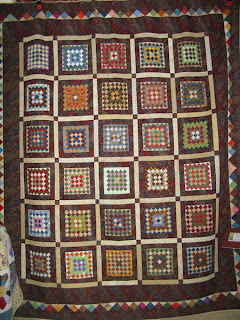 The quilts were awesome and so inspiring. I just have to share some of the ones that spoke to me. These colors just pop. Is that fun or what! I am a huge bear paw fan, so this one made me swoon. Is it not just the greatest?? 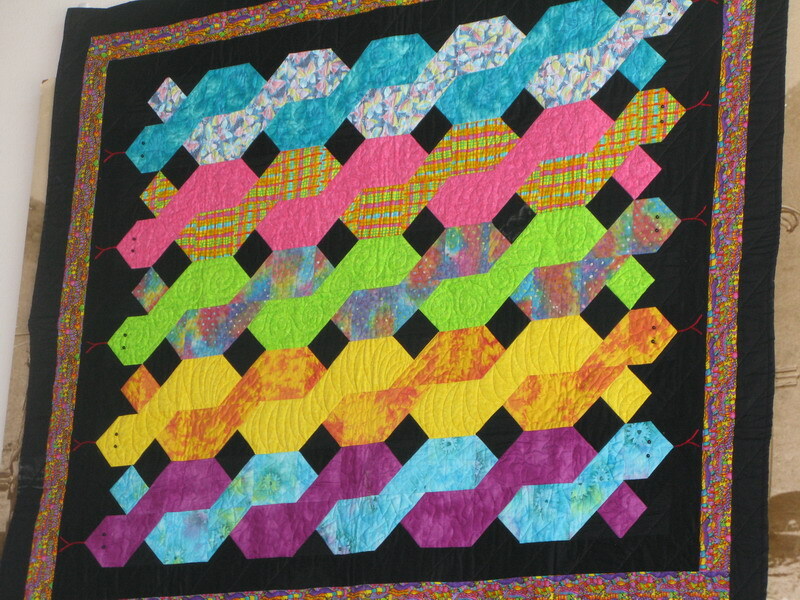 Not a fan of snakes by any means, in fact I am terrified of the slithery things, but this quilt is so darn cute! 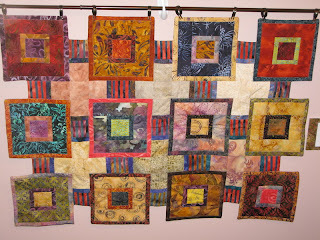 Ahhh nothing soothes the soul like a great batik piece! With purple being one of my favorites, this one really spoke to me. Another of one those great batiks! 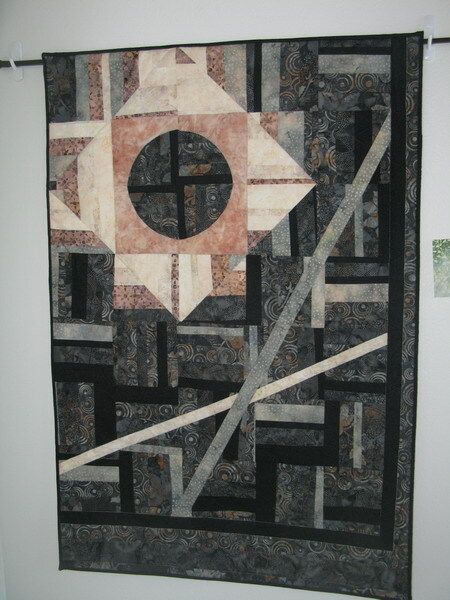 And the motion you see with this quilt design is so cool!! 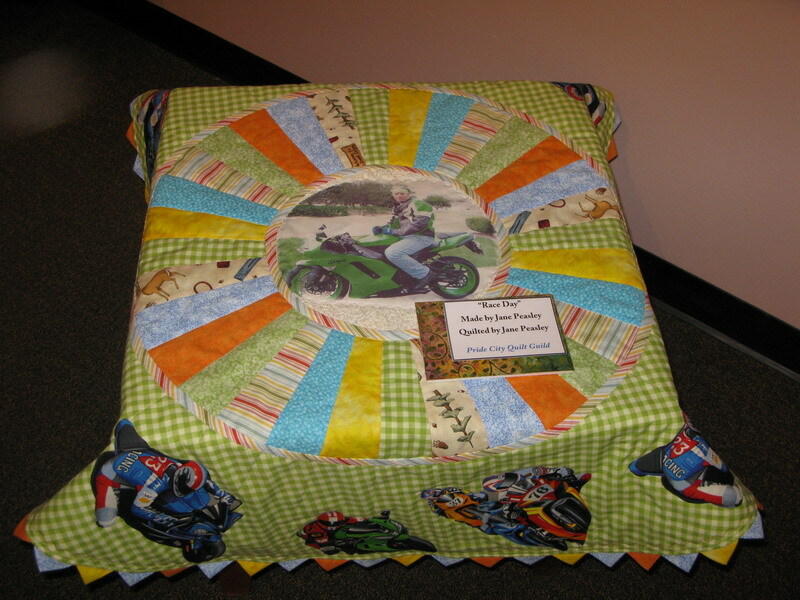 I loved this little table topper, how unique is this? 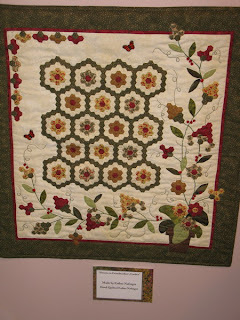 Hexagons have really been on my radar lately. Not sure if I have the time to put into them, but I sure do love them. The combination of applique with them on this quilt is so pretty! 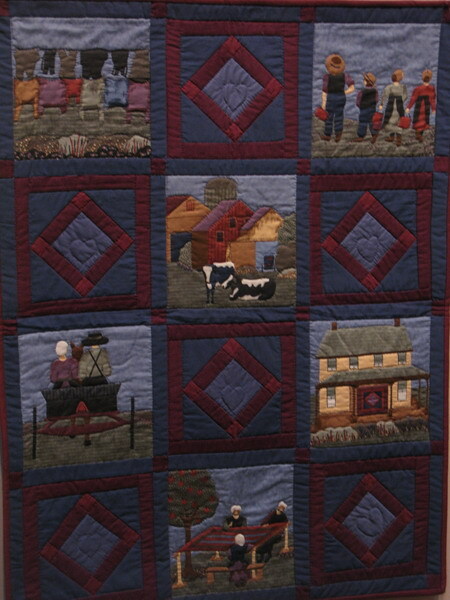 Amish Quilts get my attention every time. This one is just beautiful. 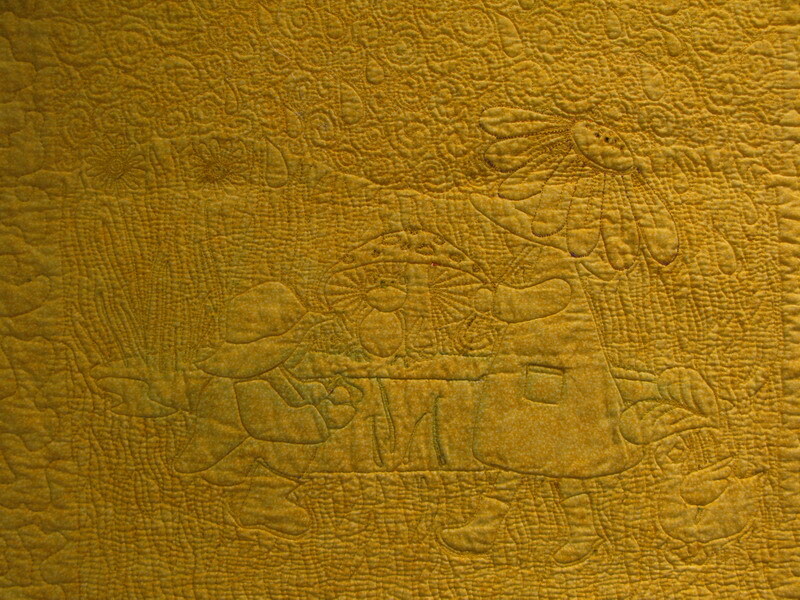 A batik magic... Brings chills to me! Dresden plates are so fast and fun to put together. 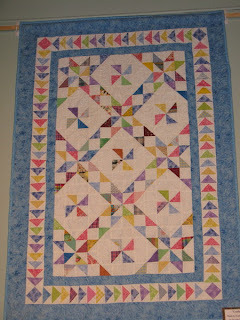 I love the quilty theme fabric she used too! Scrappy quilts!! I love love love them. So I hope you are as inspired by these as I am. I sure do wish I lived closer to Pueblo. I would love to be a part of their guild. 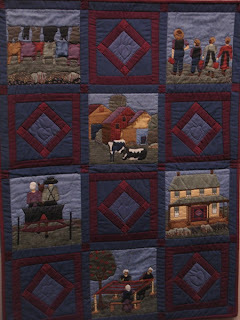 Oh by the way, I don't have photos to share, but there was a quilt, that was at the quilt show, not the guild show, that someone made. 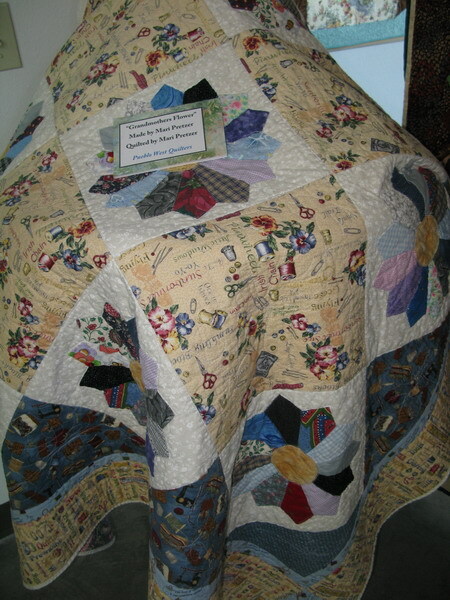 It was a photo quilt of their colonoscopy! Need I say more??? My friend wouldn't let me take photos of it, darn her. I don't know why I listen to her some times. Sure do wish I could have shared that photo!!!! Just one more Easter trivet cover. 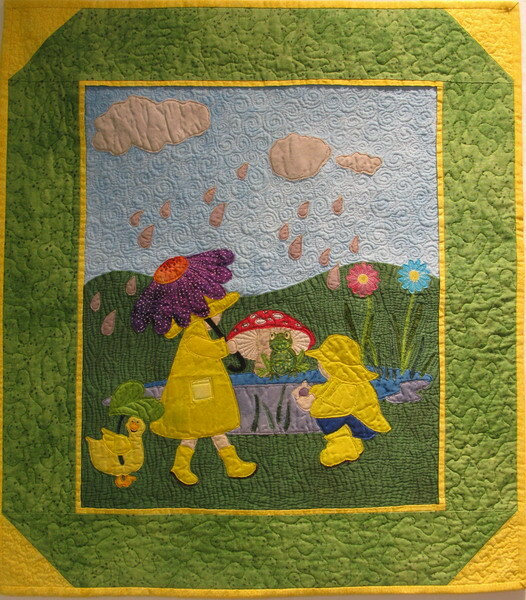 This one is for a 12" tile and you can find the pattern over at Quilters Cache. If your not familiar with their web site, it is the best place ever to find patterns for quilt blocks. They have loads of them and it's all free. 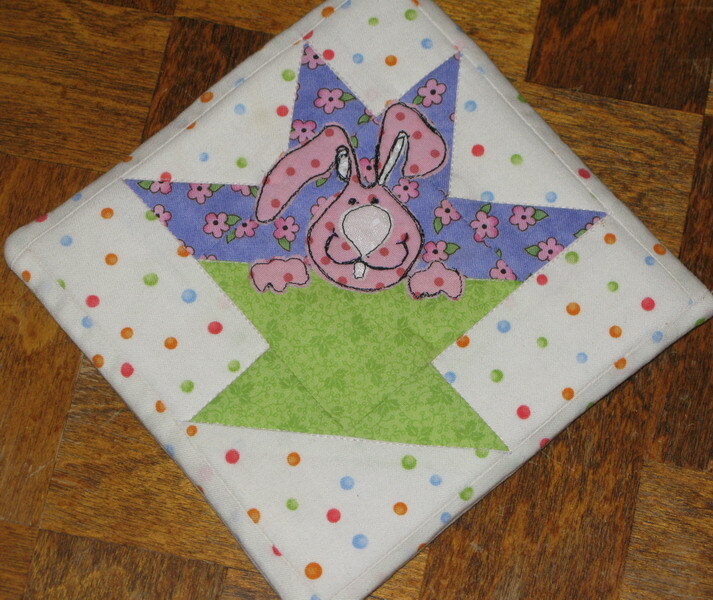 Click HERE for the pattern for this little cutie. 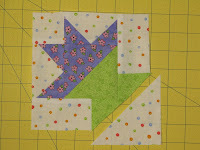 I made my basic block a little larger so I had plenty of play. 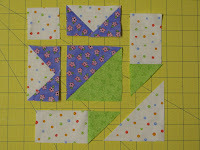 It was a good thing, as there was a lot more bulk than what I have had with past blocks, and I ended up needing it. 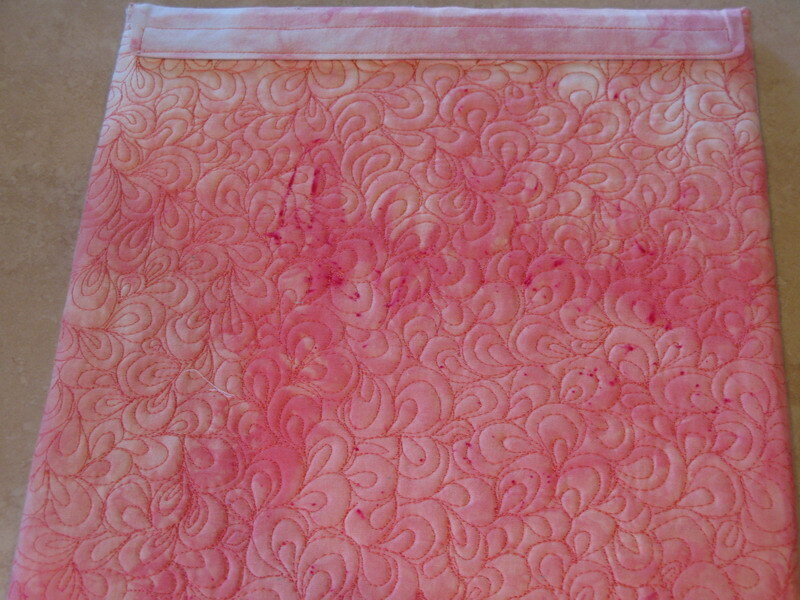 I might add that I did not piece mine as the pattern shows but I stitched it to a base of my batting/backing and a muslin top.I just did the old stitch and press over method. 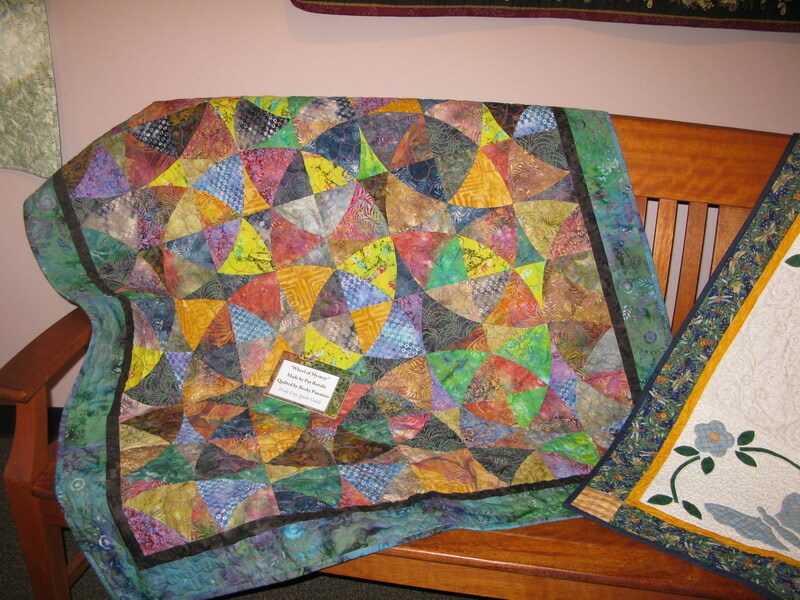 It seemed easier than stitching with such small strips of fabric alone. 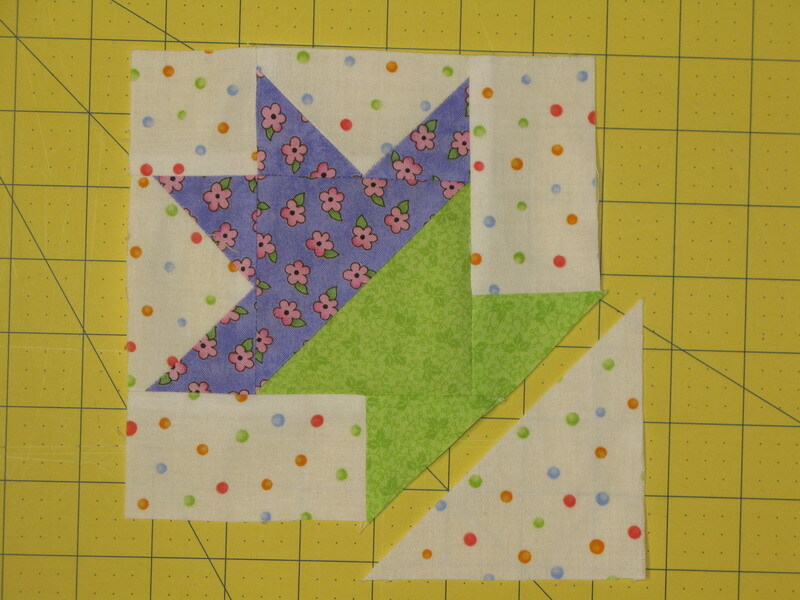 If you cut your basic block 14" you will be just fine. You can always trim down what you don't need. I found that the back was a perfect place to practice my free motion quilting. I have been stuck in a box, as of lately. I get comfortable with one style and seem to default to that all the time. This was a great way to try out something new, practice and play. 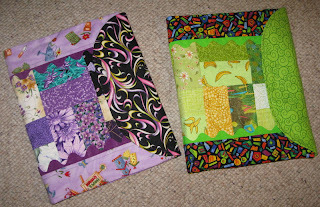 The size is really nice for allowing you to finish in a sitting too, which always makes me happy. 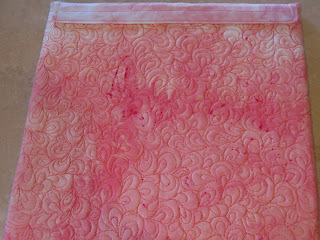 I found a stray piece of hand dyed fabric that seemed to just fit the project. You have to love those kind of moments! My swap quilt arrived over the weekend, and I am just dancing on air, I am so thrilled with it. My partner was Mary. That silly girl was worried about the swap since it was a first for her. I have absolutely no idea what she was worried about, this is a beauty. 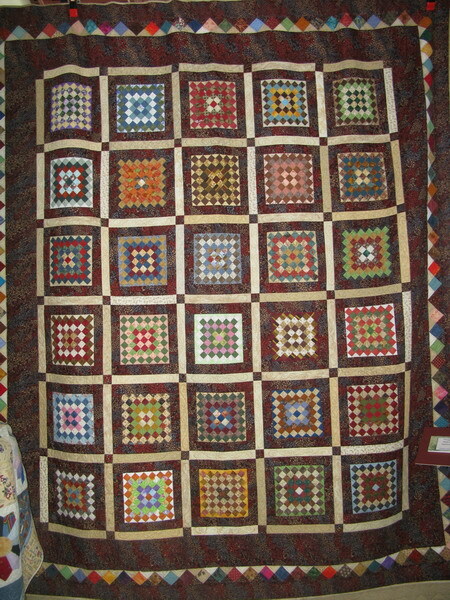 If you can't tell by the photo, the piecing and quilting is just spectacular. 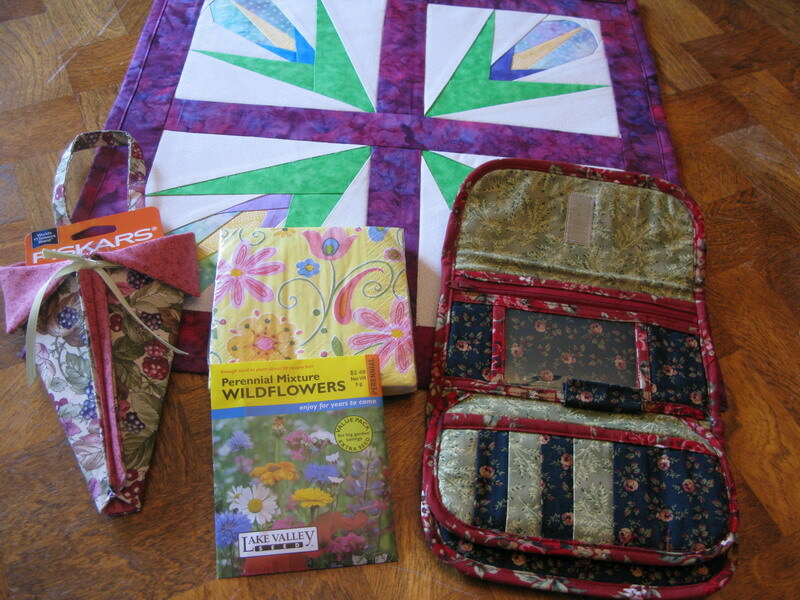 In addition she sent along a scissor keeper, and a rotary cutter blade (you know how we always need a spare one of them), a package of wildflower seeds, some bright and "Springy" napkins, and the most wonderful wallet. I told her I almost bought a new one this past weekend, and didn't, but wasn't sure why. I guess my intuition kicked in and I had no idea! I must confess, I went to move the envelope today and it seemed heavy for an empty envelope. That's when I discovered the napkins and seeds. 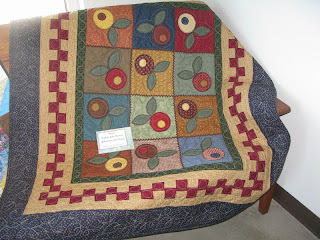 I was so excited to see my quilt that I must have completely missed them yesterday when I opened my package. Anyway, I am so happy with my treasures, and the quilt is not the only treasure I am talking about. I see many years of friendship brewing between Mary and me. Yeah!!! 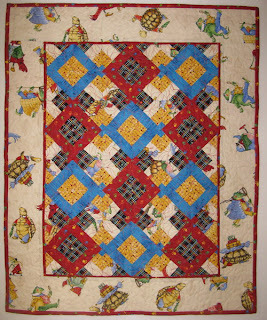 There is nothing better than a new quilting comrade! 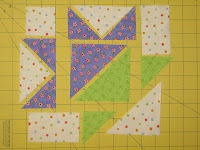 Sharon our leader picked a great swap partner for me, and I want to thank her so much. I love my Quilted Table Yahoo group! April is on us already? Didn't March just start, where does time go?? This month I've got a bright springy basket block "trivet tuxedo" for you. So here we go. 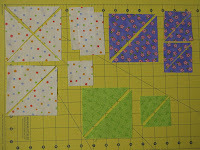 For this block we are going to need 3 colors. 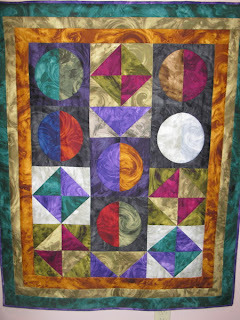 One for the background (mine is the cream color with multi spots) and 2 for the basket. 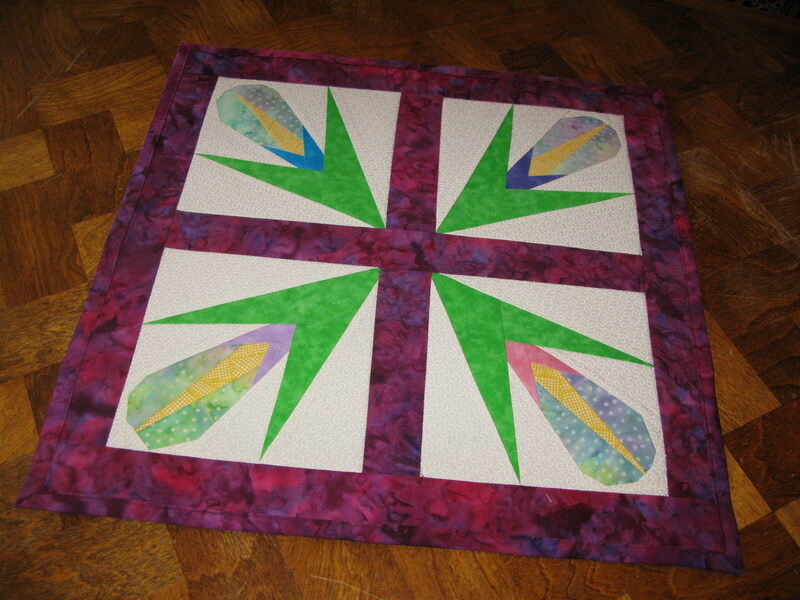 I used a green and a purple. 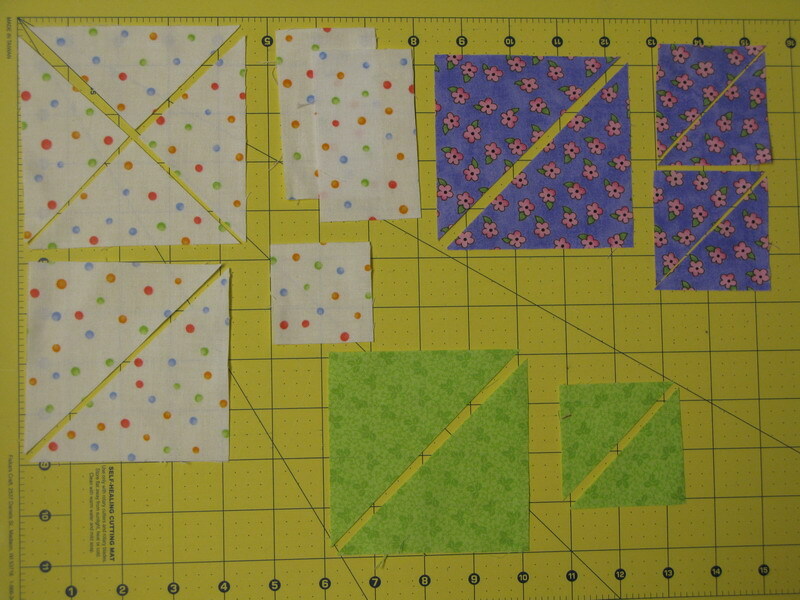 Here is the layout of the pieces. You are going to have some left over pieces from this one. Just stash them away for a future project! 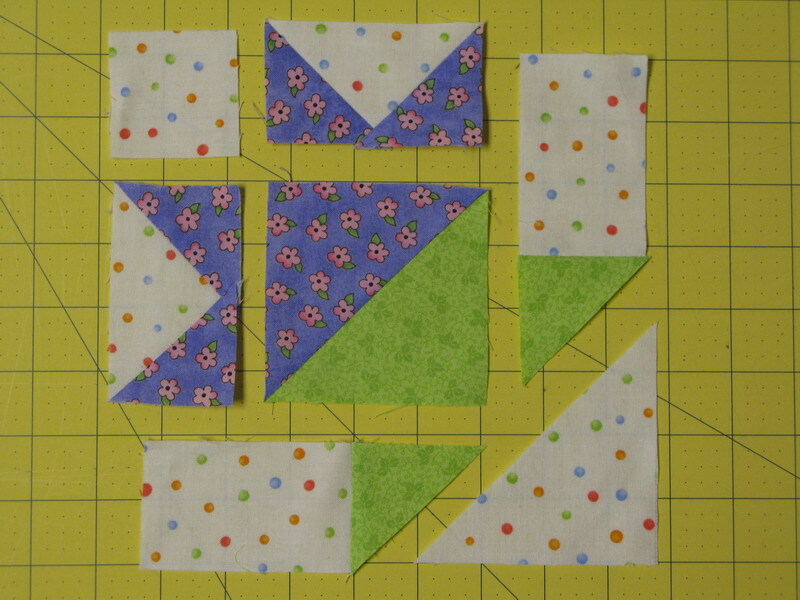 And now we start putting the block together. It's really not hard at all. So here you have it! My springy/Easter Trivet Tux. 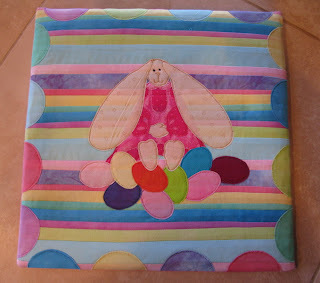 I added a little bunny for Easter. I found it in one of my old scrap book, idea books. If your a scrap booker, you probably have loads of these books and magazines yourself. 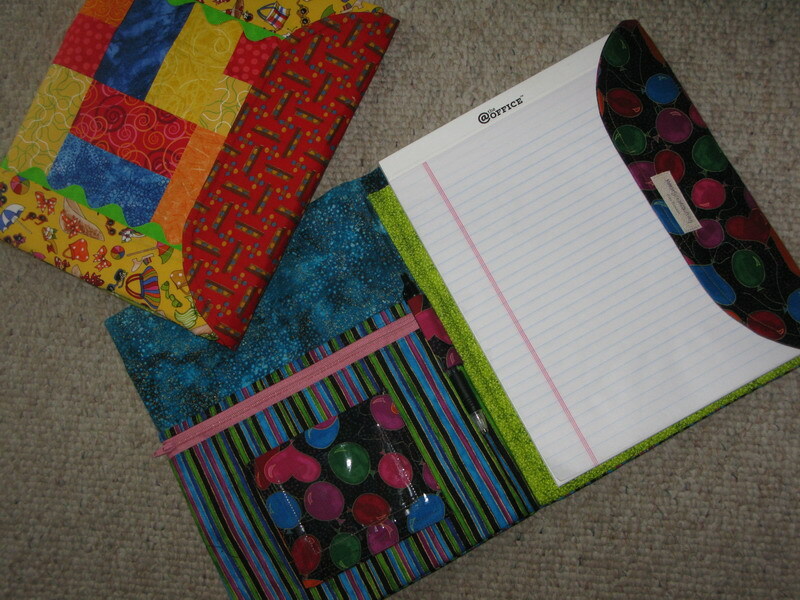 I look them mine occasionally and am amazed at how many great ideas I get from them that works well with my quilting projects! NOTE: This is for a 6" block, and to make it fit nicely on our 6" tiles, I add a 1" strip around the edges of it and trim it down to a 7" square. You can catch the more detailed instructions on past posts. The original instructions are listed under Tutorials and trivets, and all the tux instructions are under Labels and Trivet Tuxedo's. 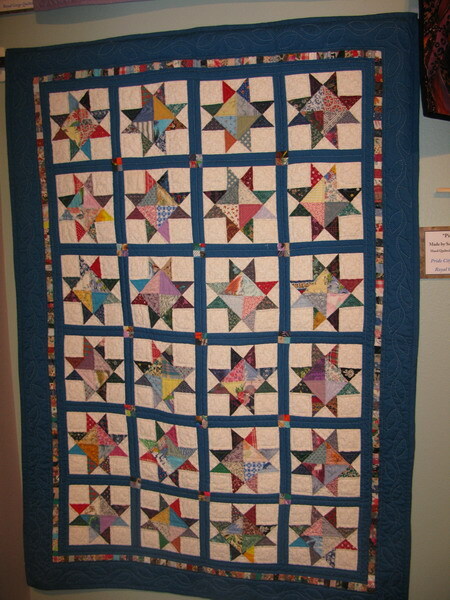 As always don't forget to share you completed project with us all!